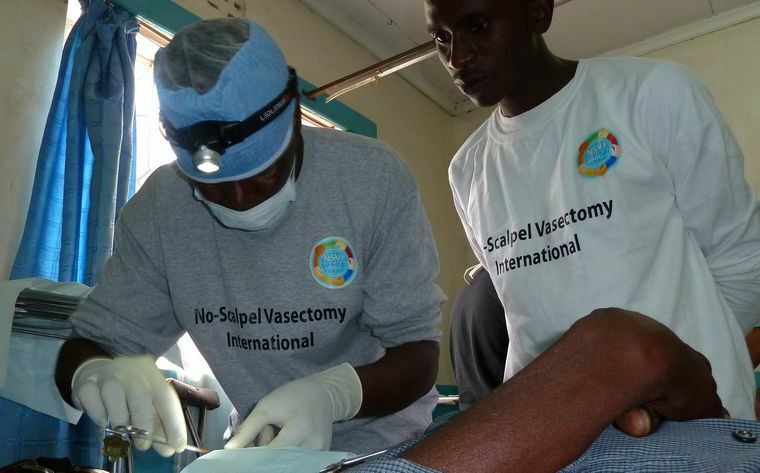 2012 Nov - Second Kenya Mission | No-Scalpel Vasectomy International, Inc. The venue for the Second NSVI Mission to Kenya was the Marie Stopes Clinic in Kisumu. 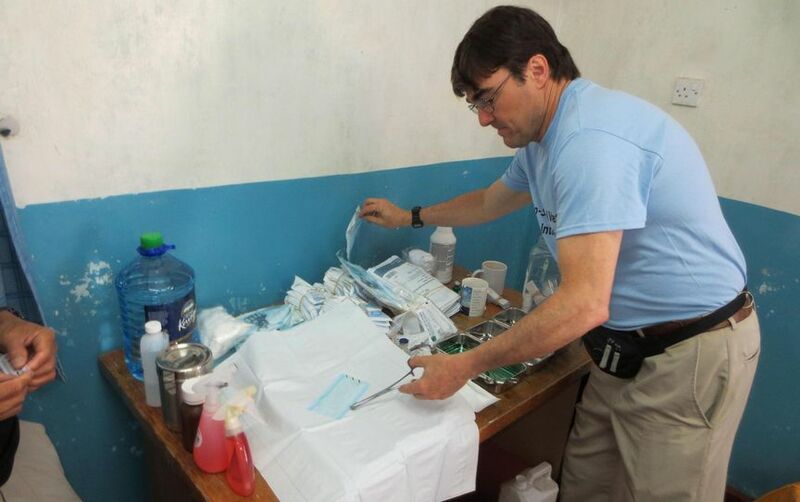 On the first day of the 3-Day mission, 19 vasectomies were performed by USA NSVI Drs. 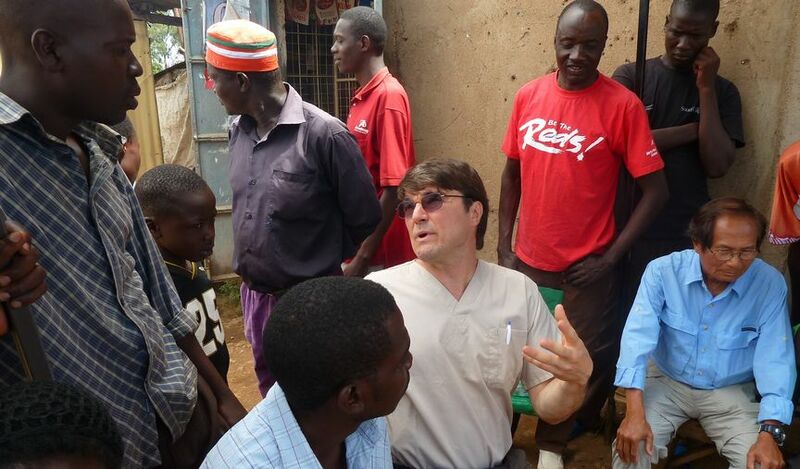 Doug Stein, Charles Monteith, and Ramon Suarez (foreground) and Kenya Director Charles Ochieng (standing far back). 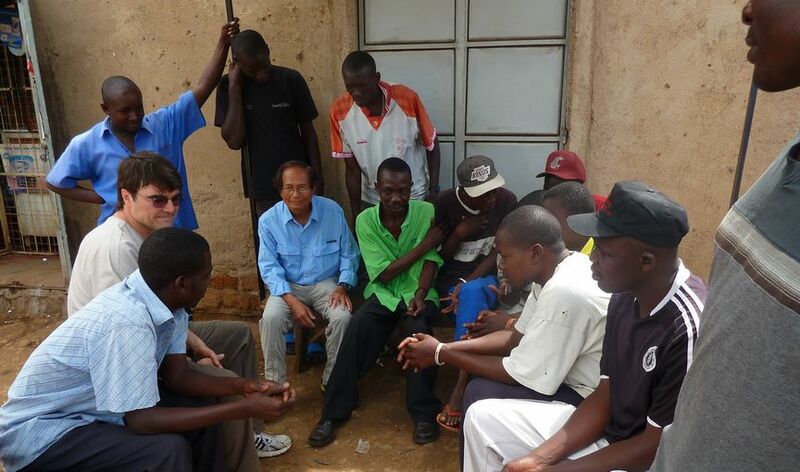 Pictured are 9 of those patients along with support staff from Marie Stopes and community facilitators. The only non-stop flight from the USA to East Africa is the Ethiopian Airways flight from Dulles Airport to Addis Ababa, where the connection to our Ethiopian flight to Nairobi is short. In Nairobi, the NSVI team transferred from the international terminal to the domestic terminal for the Kenya Airways flight to Kisumu. Kisumu is the second city of choice for NSVI Kenya missions because it is the home and workplace of our host Dr. Charles Ochieng. 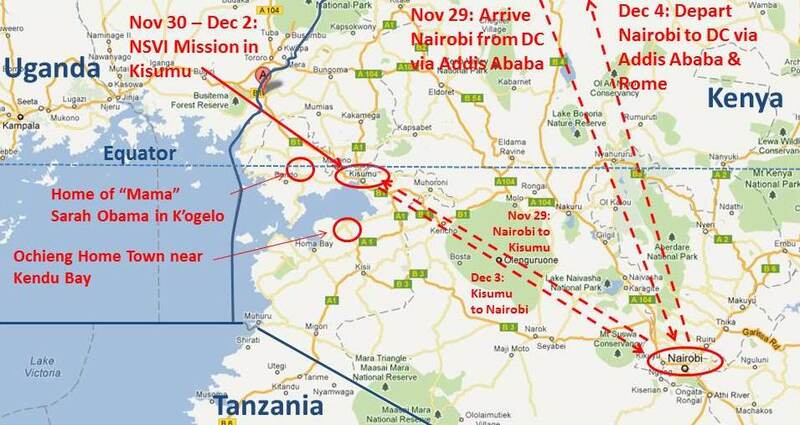 The site of the May 2012 mission was Busia (marked by the teardrop A), where Dr.Ochieng had done considerable outreach and where NSVI performed vasectomies on 53 men who had fathered 358 children. Drs. 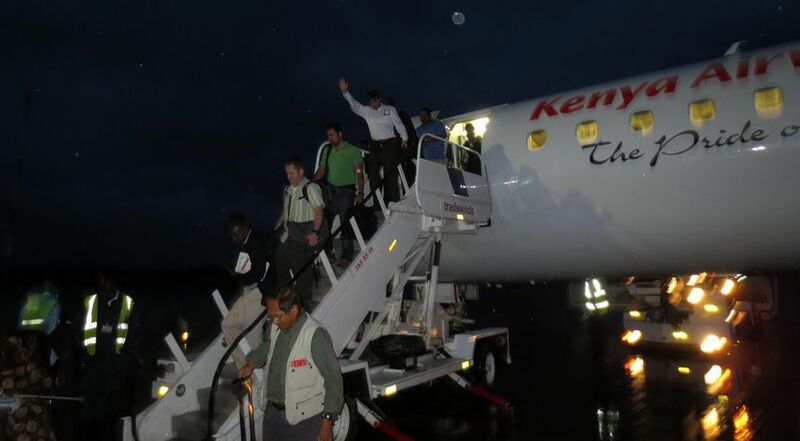 Suarez (foreground in vest) and Stein (waving) arrive in Kisumu after dark and in the rain. After a restful night at the Vic Hotel, the mission was conducted at the Marie Stopes facility pictured at the top of this page. The residents of Kisumu had been made aware of the NSVI mission by a billboard purchased by NSVI and hung a few weeks before the mission. 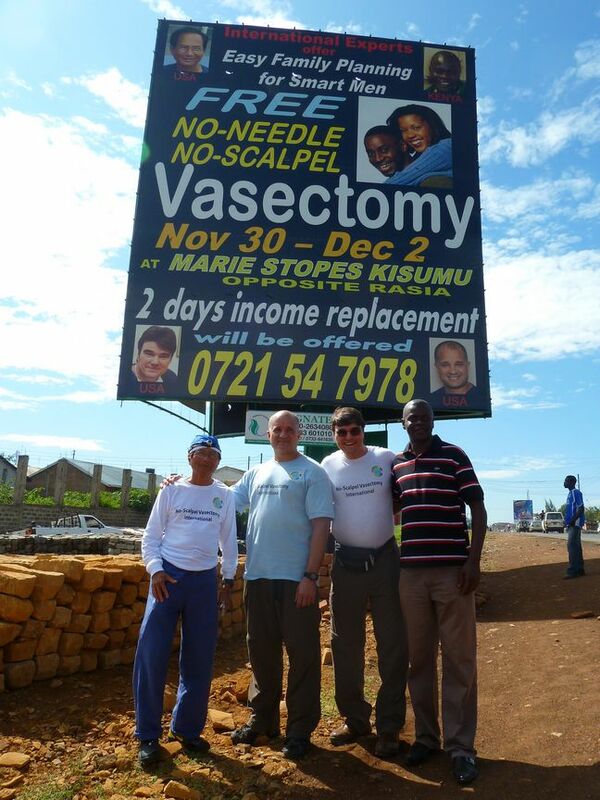 Standing proudly before the billboard are NSVI President Dr. Ramon Suarez, NSVI Volunteer Vasectomist Dr. Charles Monteith, NSVI Development Director Dr. Doug Stein, and NSVI Kenya Mission Director Dr. Charles Ochieng. 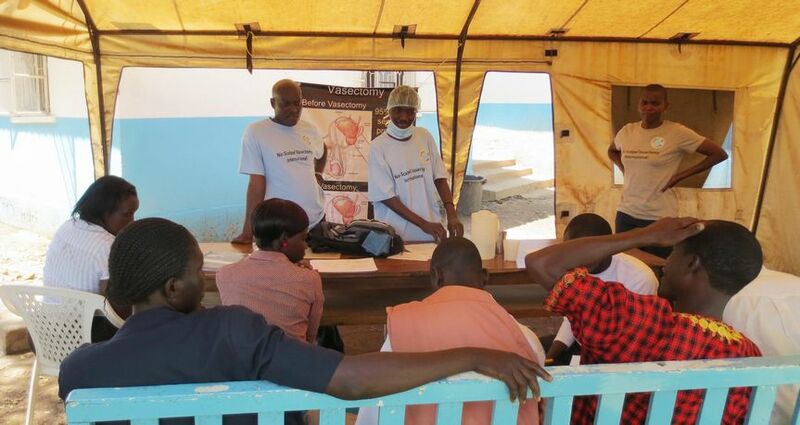 … patients were counseled in a tent outside the Marie Stopes clinic by NSVI Kenyan facilitators Charles Konzoro, R.N., and Charles Omware, R.Ph. 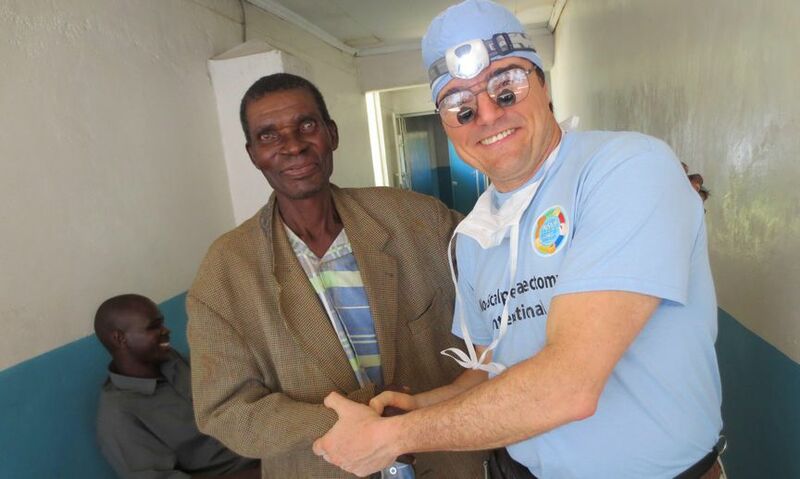 Only after full disclosure of the benefits, risks, and alternatives to vasectomy and the signing of consents (here supervised by Kenyan facilitator Sylvester) were patients brought to the procedure room. Here two teams could work simultaneously. 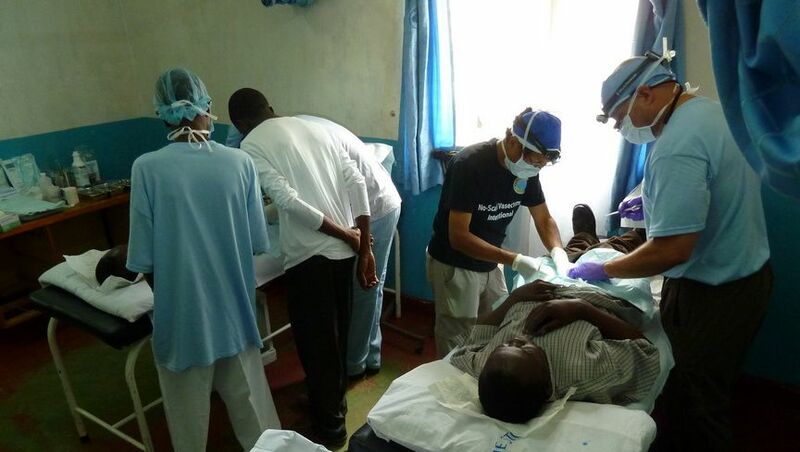 On the left, Mission Director Dr. Charles Ochieng works while facilitators Sylvester and Charles Omware learn more about the procedure in order to be better couselors. 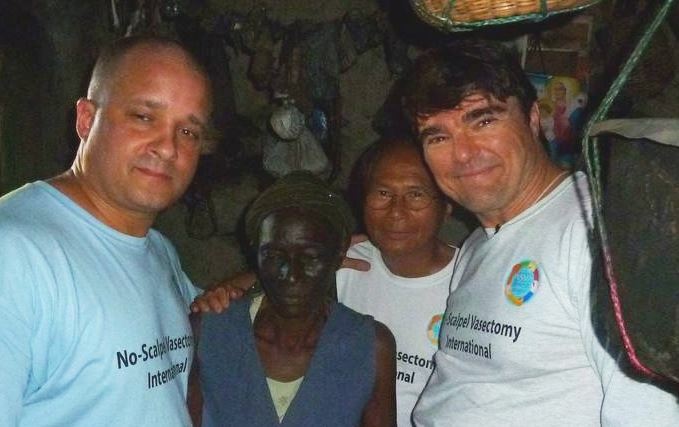 On the right, NSVI President Dr. Ramon Suarez works with NSVI Vasectomist Dr. Charles Monteith. 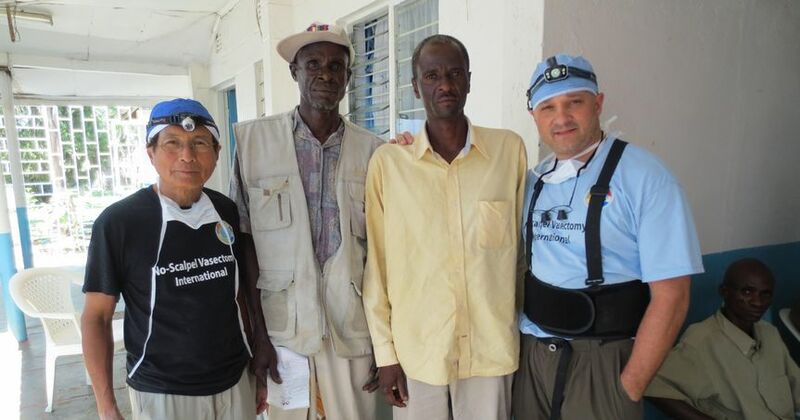 Close-up of Mission Director Dr. Charles Ochieng and facilitator Sylvester. Drs. Charles Monteith and Ramon Suarez. 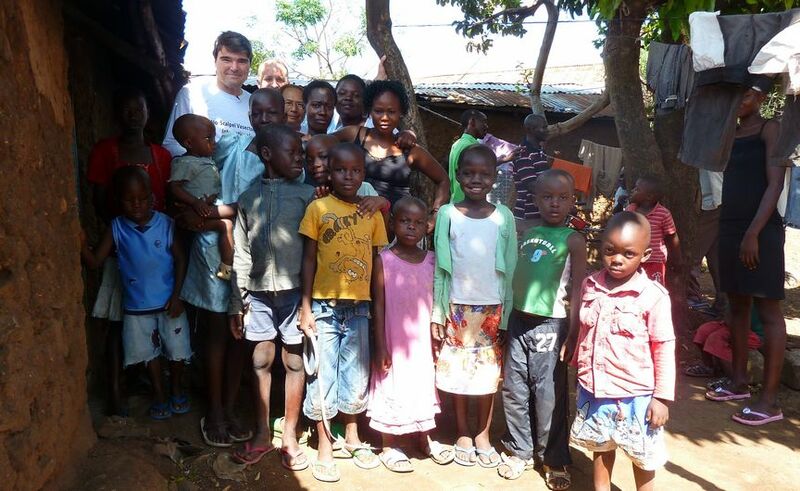 … the team visited a poor local community teeming with children. Conditions were very crowded, and houses were made of sticks and earth, with no running water. … a compassionate matron with a heart of gold. On Sunday, when men enjoyed their day off by gathering with groups of friends, the NSVI team introduced themselves and were warmly received. For most men, vasectomy was a whole new concept and there was great concern that vasectomy would hurt or compromise sexual function. 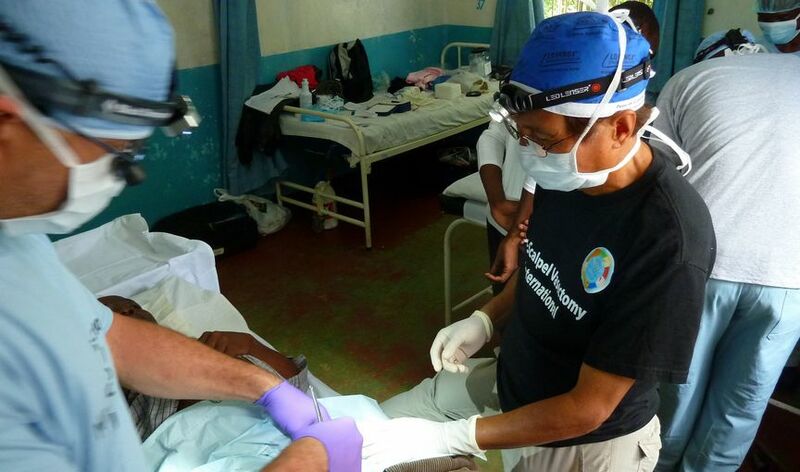 Even among men with many children, acceptance of vasectomy for this mission was low, but many asked when NSVI would return for another mission. 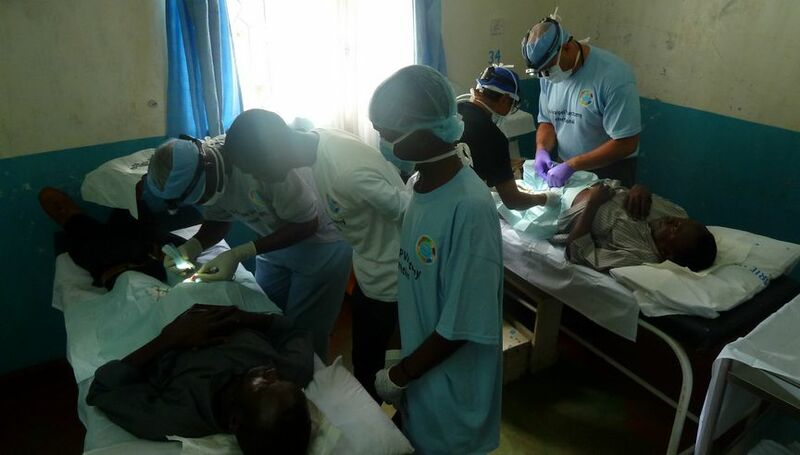 During this mission, the NSVI team had provided vasectomies to 36 men whose average age was 40 and who had fathered a total of 171 children (average 4.75 children per man). During the final day of the mission, the NSVI Team met with the staff of the Tupange Project, dedicated to ensuring access to quality family planning services for Kenya’s urban population. 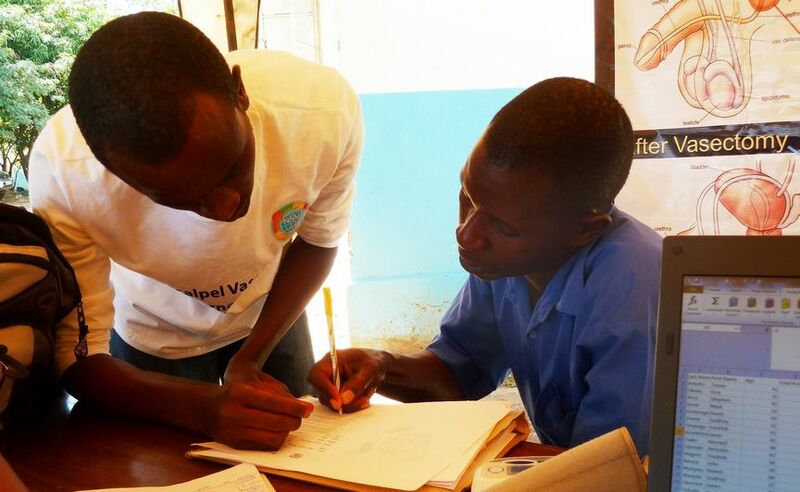 NSVI hopes to work more closely with the Tupange Project during future missions. Peter N. Kagwe, standing beside Dr. Stein, is the Program Manager in Kisumu, and Janet Aketch, second from left, is the Community Mobilization Officer. 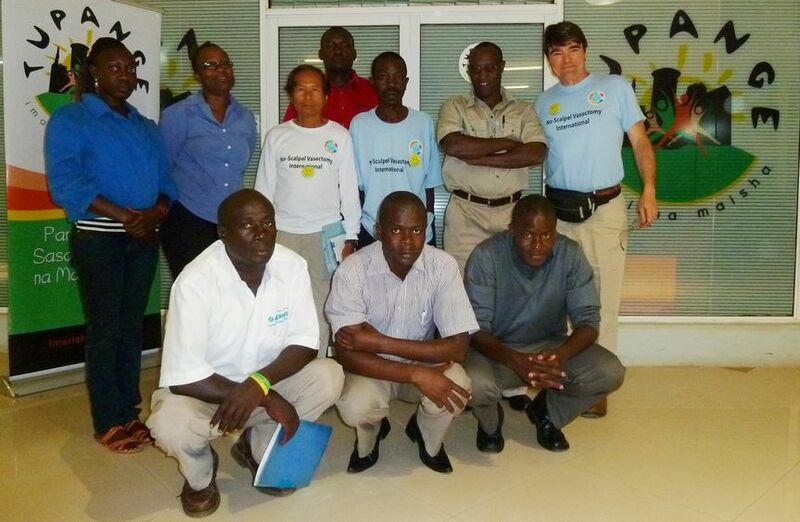 NSVI will recruit their assistance in planning the next NSVI mission to Kenya, tentatively scheduled for late July 2013, and once again under the leadership of Kenya Mission Director Dr. Charles Ochieng (first row, center).